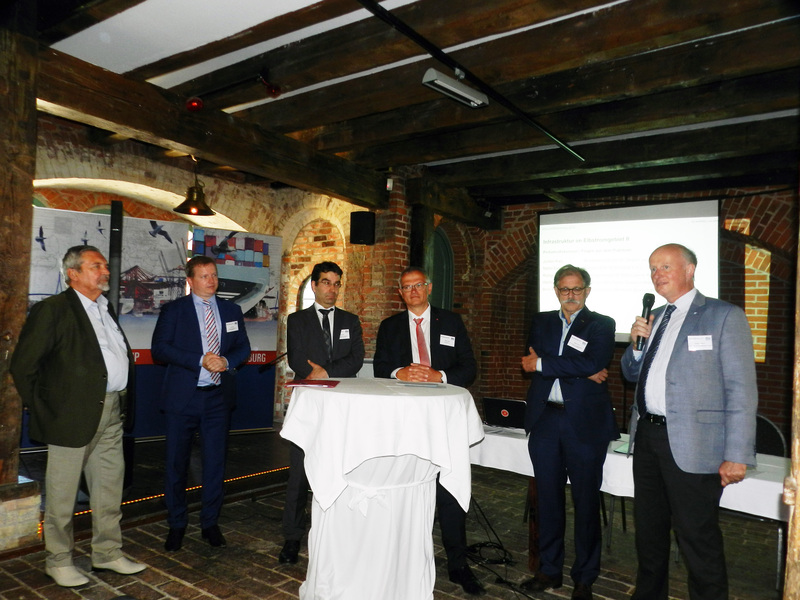 More than 120 participants gained information about the developments in the Elbe- Area on the inland navigation congress “Elbschifffahrtstag 2018” on the 24th May 2018 in Wittenberge. 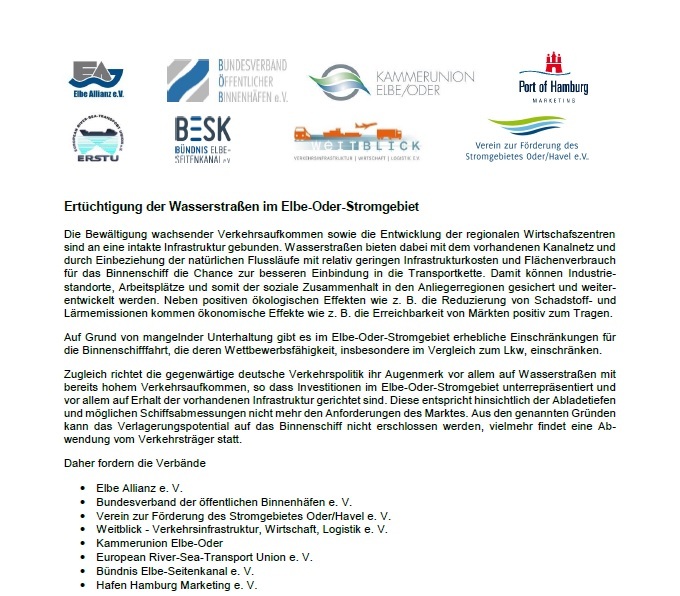 One year after the adoption of the master plan Elbe (Gesamtkonzept Elbe – GK Elbe) its implementation status was of great interest to participants. This congresses is organized by the Elbe Allianz every two years. The association with more than 120 members takes over an active role to promote and lobby for inland navigation in the Elbe area. The association was member of the consultancy board during the process of developing the GK Elbe. Chairman Stefan Kunze requires to speed-up the implementation of the adopted masterplan Elbe, to better integrate inland navigation in modern transport chains. Kunze explained: “A good example for an integrated logistic chains could be the transport of containers between the seaport Hamburg and inland ports along the river Elbe, making use of all modes of transport like barges, trains and trucks -corresponding of the cargos’ demands”. He appreciated continued progress in other river basin areas: “The start of planning procedure ar the lock Lueneburg in the Elbe-Lateral-Channel and the reconstruction of the Elbe-Luebeck-Channel is an important and needed step in the right direction to enhance inland navigation”. Ines Jesse, state secretary of the Ministry of Transport of Brandenburg, stressed the importance of the river Elbe for her federal state. She added, that it cannot be the only solution to improve the infrastructure by federal government investments. “Together with Hamburg and Saxony-Anhalt we tendered the study ‘Elbe 4.0’ to investigate in possibilities to improve the competiveness of inland navigation by digitalisation measures. Our objective is to rise the freight traffic on the river Elbe”. During the first panel discussion Thomas Gabriel, Federal Waterways and Shipping Administration, reported about the implementation process of GK Elbe. He explained, that significant delays in its implementation are caused by shortage of engineers. Nevertheless first progress will be visible in the project Kloeden which is about to stabilize the riverbed. A tender to study another important bottleneck (so called “Reststrecke”) will be public by end of 2018. Christoph de Vries, member of German Parliament and chairman of the task force Elbe of CDU faction, assured his support to solve the shortage on staff. “Together with my colleague Dagmar Ziegler from the SPD faction we coordinate steps to implement the adopted decisions and to get the necessary resources needed to bring this project to success.” he added. Environmental aspects were in the focus of presentation by Rocco Buchta, representative of NABU. He explained his ideas for the river Elbe by making use of the renaturation example lower Havel-River. The measures led to a successful ecological enhancement of the river; a model he supports for the river Elbe too. In the second thematic complex Jochen Kies, Federal Ministry of Transports, informed about the development on the other rivers and channels in the Elbe-Area. The already mentioned improvements for the Elbe-Lateral-Channel and the Elbe-Luebeck-Channel are in process and required engineering work force employed. The navigation on the river Saale will be secured by systematic reconstruction of the old locks. The Saale-Lateral-Channel is included in the German Federal Transport Plan 2030, however unfortunately low prioritized. The following panel discussion involved some representatives of lobby organizations which highlighted further demands. Even though the new ship lift at the Elbe-Lateral-Channel is in the planning, the Uelzen locks urgently need replacement as well. “A failure of the currently only useable lock chamber will result in a break in traffic on the entire canal”, explained Martin Exner, Alliance of Elbe-Side-Channel. In such case the Elbe would be the only alternative route with all its current challenges and that’s why urgent improvements are necessary. He added, that the improvements are not only necessary for its by-pass function but also for containerized transport on three tiers and project cargo. Rüdiger Schacht, Chamber of Industry and Commerce Luebeck, explained the importance of the Elbe-Luebeck-Channellinking the Elbe-Area and the Baltic Sea. Boris Kluge, Federation of German Inland Ports, presented the INTERREG V B project “EMMA” which aims to enhance inland navigation in the Baltic Sea region. Gerald Hirt, Hamburg Vessel Coordination Center, explained, how his enterprise helps to improve the coordination between inland barges and sea terminals. The system consists the coordination of arrivals, increase the quality of handling operations at Hamburg’s container terminals and ensure reliable rotation for barges around the Port of Hamburg. The aim is to coordinate all container lines via this service. To sum-up technical and technological improvements were in the focus of the Elbschifffahrtstag 2018. The topics varied from digitalization (study “Elbe 4.0”), international project co-operations (EMMA) via the demonstration of new propulsion systems (push boat ELEKTRA with hydrogen and fuel cell technology) to technological solutions. The conclusion of the “Elbschifffahrtstag 2018” was clear: After decades of standstills in the Elbe Basin region the process of improvements of inland waterways was re-started. To achieve the objectives a lot of efforts of all involved stakeholders is necessary. A closer cooperation of the lobby organizations is definitely needed and supportive in this process. This resulted in another highlight, as three associations will bundle forces in future to be better heard at policy level by making use of their individual strengths. Thus, the “Verein zur Hebung der Saaleschifffahrt e.V.“ and „Weitblick – Verkehrsinfrastruktur, Wirtschaft Logistik e.V. will merge with Elbe Allianz e.V.”. Last named association will adapt its internal structure and working groups accordingly to best possible meet its new possibilities by making use of gained new competence and capacity.